Part of podcasting is that you have to purchase a lot of equipment right up front just to get started. I completely understand that the expense of equipment holds a lot of podcasters back from starting something. The good thing about Soundtrap is that it allows you to record into their application with a USB microphone or your computer's on-board microphone. As much as I like the ability to record with a USB microphone, I'm not to keen to the idea of recording any podcast through an on-board computer microphone. If you want to make a quality podcast, I recommend that you at least buy a Blue Yeti USB microphone or get the Audio Technica ATR2100 to start out. In addition to using the USB microphone, Soundtrap also gives the podcaster the ability to monitor their voice through the headphone jack on their computer. When I tried this with my Blue Yeti USB mic, monitoring sounded a little strange and didn't sound clear. There was a clear misrepresentation of what my voice sounded like going through the headphones and what was showing up in the final recording. When I stopped recording and heard the playback, the recording sounded good. I won't say that it sounded great, but it was good enough for a web-based application. I've used the Blue Yeti USB for about 8 years and never have I ever encountered a sound monitoring the way I did when I plugged it into Soundtrap. I'm sure that if I were able to fool with the settings a little more, I'd be able to figure out what the problem was. The problem could be the Blue Yeti itself since it already has a headphone jack on the microphone itself, but I can't be for sure until I do a deeper diagnosis on this issue. I'd be curious to see how this microphone reacts to other USB microphones like the ATR 2100. When everyone on the internet is looking for the best way to record guest interviews or create a podcast with a co-host who is in a remote location, there are so many solutions. However, those solutions can be a bit cumbersome in terms of set up. I'll even admit that my Skype call recording setup is a bit cumbersome because one has to make sure everything is running through a Yamaha MG10XU appropriately while being connected to Skype correctly. Nevertheless, I will still use my own Skype call setup because it's the closest thing you can get from how phone calls are taken in a radio station. Sountrap's Collaboration tool provides a simplified solution to record a podcast with someone else who is in a remote location. I see this as a benefit to podcasters who are looking to do a co-hosted podcast. The only thing that a co-host would need is an actual Soundtrap account and the two hosts can start collaborating immediately. If there is an instance that you want to have a guest on your podcast, you will need those individuals to set up a Soundtrap account. This process can be cumbersome for those who aren't familiar with the platform, so just be aware. You may have to prep your interviewee about the platform a few days ahead of time before you start recording with them. One of the cool things that you can do inside of Soundtrap is that you can make sure your audio has a clean sound like that of a radio station--given that you're using a quality microphone. If you go thumbing around inside of the application you will see there are Compression and Equalization tools that you can use for your voice tracks. When you set up these tools, you can save them as presets for anytime that you record a podcast. For a web-based application, I was surprised that an application that was web-based would actually be able to achieve something that is very prominent in programs like Audacity or Adobe Audition. If I had to give a grade to how well these tools make your voice tracks sound, I'd give them a B+. This is a great option if you can't afford music to purchase through something like Audiojungle. I can't say whether there really is a downside to this feature because I've not gone inside the actual application and figured out how to create my own music. But if you're podcasting on a dime, this could be an option before you get started. I realize that when you first want to start recording a podcast, you don't want to spend $20 a month on a program like Adobe Audition. I also realize that getting a Creative Cloud subscription doesn't make sense if you don't know how to use Adobe Audition. Don't get me wrong, I think you should still look into investing in learning how to use Adobe Audition to make your podcast workflow much easier, but when you're first starting out, all you need is the bare essential. 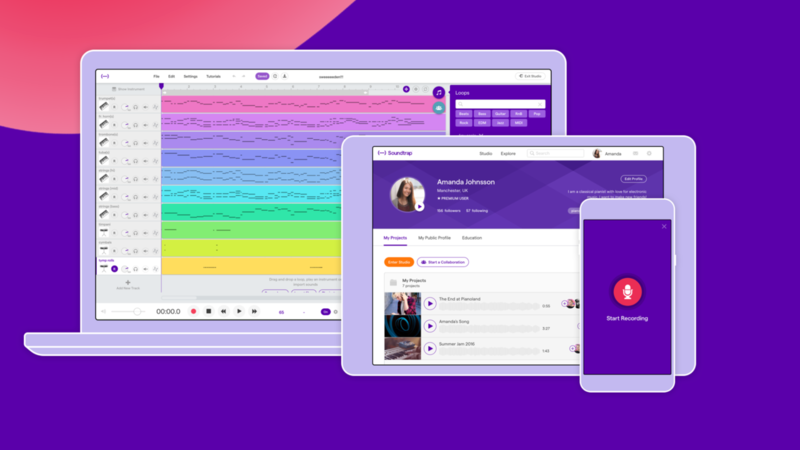 When you first sign up for Soundtrap, you are given a chance to use the free version of the application and record up to 5 projects on the free plan. This is a great option if you're only doing one podcast a week. If you want to do more than 5 podcasts per month, their $3.99 plan is a viable option if you're trying to keep costs low before you figure out where you want to take your podcasting journey. In this section I want to talk about some of the things that might make the podcasting process a little cumbersome for content creators. Please be aware that these are only my opinions of how I've used Soundtrap on a few tries. I believe that I would need to put in some more hours into using the application in order to give a thorough review. Anytime you record a piece of audio into Soundtrap, you're going to be using up some of your CPU. This is no different than if you were to use something like Adobe Audition, but the difference here is that you're using a web-based platform. Recording large pieces of audio could potentially slow down your computer if you aren't running a decent PC or Mac. Upon finishing a podcast recording, you can click into individual tracks and FREEZE a track so that it doesn't take up any CPU storage. This is a good thing. One of the reasons I record and edit inside of Adobe Audition is because the application is always saving your work without you knowing it. There have been times when I have been editing a podcast and the application decides to crash. When you reopen up Audition, you are prompted with a screen that asks you if you want to recover the piece of audio that you were working on. Adobe has done a lot to make sure their applications are stable and don't crash as much, so I haven't experienced too many crashes unless I've had too many applications open on my computer. When it comes to Soundtrap, you don't get the option to have your work autosaved--especially when you're recording an interview. In fact, I believe you have to take breaks in the middle of your interview in order to save your work. Because you're working with a web-based platform, the web browser could crash at any moment. It doesn't matter if you're using Chrome, Firefox, Safari or whatever else, web browsers crash. When I want to import a piece of audio inside of my Adobe Audition session, I'm able to find my audio files in a folder on my computer and drag them into Audition to start editing within seconds. Soundtrap doesn't give you this option to import so easily. Although their multitrack interface allows for you to add tracks for recording easily, it's still requires you to look for the file as opposed to having one of your file explorer windows open to drag and drop your audio files into the multitrack editor. When it comes to moving tracks, you can move them within the same layer on your time line, but only on the same layer. It's important to make sure you know which layers are dedicated for recording voice tracks. You will also need to make sure you're naming each layer of your multitrack editor so you can be organized when it comes to the editing process. Within Adobe Audition, you have the ability to move actual audio files by clicking and dragging the audio and moving it to a different layer. This makes for a speedier editing process and will help you organize yourself down the line. But if you're using Soundtrap, just understand that the process of clicking and dragging individual audio files within the multi-track editor doesn't exist. However, if you want to move individual layers, you can do this with the left panel of their multitrack editor. At the end of the day, you're going to need to figure out your own workflow to make sure that you know which pieces of audio are being played on which layer. After you record a podcast, you may want to go in and edit the podcast for content that won't be used. One thing I discovered while using Soundtrap is that it has fine editing tools that you can use. If you have a piece of audio where you want to edit out a section, you'll simply want to press CTRL/CMD + E to make a splice in the audio. From there you can make seamless edits by dragging one piece of audio closer another and make it sound like there wasn't a break in the conversation. Make sure that you have the SNAP TO GRID tool disabled so you can make some of these fine edits. Considering this is a web-based audio editor, I'd say it's not too bad to use if you want to get started with podcasting. I actually think that you can use my Basic Podcast Setup with this recording editor if the editor allows you to connect your Yamaha MG10XU mixing board to the interface. I can't be sure what kind of sound you will get out of the recording, but I'd imagine that it would be pretty decent. One of the biggest complaints from podcasters is the fact that editing takes so long. Some podcasters complain that it takes them hours upon hours to edit up a 1 hour podcast. Part of this has to do with the fact that podcasters also have to become editors--and most podcasters aren't skilled editors. So the biggest issue is the amount of TIME it takes to edit up a podcast. Knowing what I know now about Adobe Audition and Pro Tools, editing on cheaper or free software is going to have issues when it comes to saving you time. Soundtrap simply doesn't have a lot of the key shortcuts that I'm currently using inside of Adobe Audition. This isn't just for editing up a podcast either. This also goes for those individuals who want to create unique brand intros and outros for their podcast. It's very possible to use Soundtrap as a means to create some type of sound design for a podcast intro, but it will take a lot of time. Considering this is a web-based audio editor, I'd say that it could be a rival to that of Adobe Audition if there were simple shortcuts, ability to move individual audio files, the ability to zoom in on your audio with your mouse wheel and simple keyboard shortcuts that don't require you to use the CTRL/CMD keys. Adobe Audition does use these keys, but if you have set up your shortcuts right, you don't have to use CTRL/CMD at all. Either way, I think Soundtrap is great starter editing software for the beginning podcaster or a podcaster who might be in a pinch when they need to record a podcast interview. It's a great program to get the aspiring sound designer and editor to jump right into Adobe Audition. Bravo to Soundtrap for this application solution!